"Have you heard the news? There's a storm coming! And according to the latest weather models, it's going to be a big one, so you'll want to be prepared. After you pick up your groceries and get your phones charged, stop by the store today and grab yourself a great read! Below, check out our staff recommendations for Fun Reads, Young Adults and Picture Books that are sure to keep you entertained during a blizzard--and don't forget a book light in case the lights go out!" 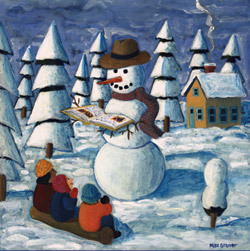 --from an e-newsletter sent out yesterday by R.J. Julia Booksellers, Madison, Conn. Effective April 1, Reagan Arthur will become senior v-p, publisher of Little, Brown, succeeding current publisher Michael Pietsch, the incoming CEO of Hachette Book Group. Arthur, who will also join Hachette's executive management board, began her career at Little, Brown in 2001 and was named v-p, editorial director of Reagan Arthur Books in 2008. In assuming her new role as publisher, she will retire the imprint she has led. "Soon after Reagan Arthur arrived at Little, Brown one of our sales reps told me, 'I'll read anything Reagan recommends,' " said Pietsch. "Throughout the world of writers, booksellers, librarians, bloggers, scouts, literary agents, and international publishers, Reagan's name has come to carry that same weight. Reagan was born to the work of publishing, she understands it deeply, she possesses a publisher's relentlessness and charm, and she is hungry for more." Arthur said she is "thrilled and honored to have the opportunity to work with some of the greatest writers and colleagues in the business. Michael is an incredibly tough act to follow, but I've been lucky to learn from him, and I'm excited to be part of this next chapter in Little, Brown's 175-year history of publishing important, lasting fiction and nonfiction." Among the many bestselling and prize-winning writers she has acquired and edited since joining Little, Brown are Tina Fey, Joshua Ferris, Kate Atkinson, Elin Hilderbrand, George Pelecanos, Ian Rankin and Elizabeth Kostova. Last year, two debut novels from Reagan Arthur Books--The Snow Child by Eowyn Ivey and The Lifeboat by Charlotte Rogan--were New York Times bestsellers. Pietsch noted that "placing the reins of Little, Brown in the hands of one so capable, insightful, and assured gives me the richest confidence in its future." General retail sales for January were "strong," with retailers "offering merchandise and deals that drew in shoppers in spite of higher payroll taxes," Reuters reported, cautioning that investors are "worried that the sales owed too much to margin-sapping discounts and that the tax hit to take-home pay would hurt spending in coming months." For the month, sales at stores open at least a year increased 5% at the 20 retailers tracked by Thomson Reuters. The result was above analysts' estimates of a 3.1% gain, Reuters noted, adding that analysts consider January "a low-volume month, so the numbers are less important than, say, those for November and December." The International Council of Shopping Centers expects February same-store sales to rise 2.8% to 3%. "January sales don't give you much of a sense what's coming," said Dan Hess of Merchant Forecast. "How much of it was clearance; how much of it was new merchandise?" Survey respondents reported revenue growth of 6.8% on average, with more than two-thirds experiencing revenue growth in 2012--a larger share than in the 2011 and 2010 post-holiday surveys. Independent businesses in communities with an active "buy local first" initiative run by a local business organization reported average revenue growth of 8.6% in 2012, compared to 3.4% for those in areas without such an initiative. Among survey respondents in cities with a "buy local first" initiative, 75% reported that the initiative had had a positive impact on their business. "Showrooming" was identified by independent retailers as one of their biggest challenges, with more than 80% saying it was affecting their business and 47% describing the impact as "moderate" or "significant." Lack of financing was also a challenge, as 23% of respondents said they had been unable to secure a needed bank loan for their business during the last two years. ABA CEO Oren Teicher said the ILSR study "and the outstanding results of the Small Business Saturday last November--make clear that we have reached an important tipping point, as shoppers are showing through both their purchases and their direct feedback to indie businesses that they value the diversity, creativity, and unique services of their hometown businesses. For indie businesses in communities that don't yet have a local business alliance, the time to realize the potential of working together is now." A new patent granted to Amazon last week "could go a long way toward making the digital media in our lives a lot more like the physical version," Wired magazine observed in its analysis of the online retailer's potential ability to sell "used" e-books and other "digital objects." Describing the proposed used marketplace as working "similarly to Amazon's Kindle e-book lending process," Wired reported that "instead of loaning the access rights of an e-book, music file, video or application, in exchange for some cash, the original owner of the digital file would transfer the rights to use that file to another party permanently." Bill Rosenblatt, a consultant and expert witness in digital content patent cases, does not believe a digital resale marketplace would make Amazon a lot more money on books or music initially, but "he thinks it would move much more of Amazon's digital content business beyond the interference of publishers, just as publishers can't dictate the terms of, for example, the sale of used physical books on Amazon. Just as with physical books, publishers would only have a say--or get a cut--the first time a customer buys a copy of an e-book. The second, third and fourth sales of that 'same' e-book would be purely under Amazon's control," Wired wrote. Emmett McDonough and Sharon Hoshida plan to open Granada Books in downtown Santa Barbara, Calif., in June. With the help of the Bookstore Training Group of Paz & Associates, the pair aim to "cater to the local market" and emphasize children's books, fiction, food and wine, gardening, the arts (both fine and folk), current issues, healthy living, active lifestyles and gift items for readers and writers of all ages. They will also focus on local writers and regional interests as well as carry scholarly books that support the area's institutes of higher learning, including the University of California at Santa Barbara. The store will have more than 2,800 square feet of selling space as well as a garden courtyard event and performance space. McDonough is a retired corporate executive who will provide business acumen and financing. Hoshida, former director of the Women's Center at UC-Santa Barbara and a community activist, will draw upon her extensive network for marketing outreach. The two will not be involved in day-to-day operations of the store and are seeking a general manager, an operations manager and a marketing coordinator. "We want a bookselling team that will create a vibrant and welcoming environment while keeping customer service our number one priority," Hoshida said. Granada Books will be located at 1224 State St., Santa Barbara, Calif. 93101. For more information about staff opportunities, contact Paz & Associates at 904-277-2664. Canadian publisher Douglas & McIntyre, which filed for bankruptcy protection in October, has been sold to Harbour Publishing and will continue operating, CBC News reported, noting that Harbour "has reached a deal to purchase Douglas & McIntyre's assets, saving the storied publishing imprint." Last week, D&M Publishing reached a separate agreement to sell Greystone Books to Heritage House Publishing. Image of the Day: Remember the MPIBA! 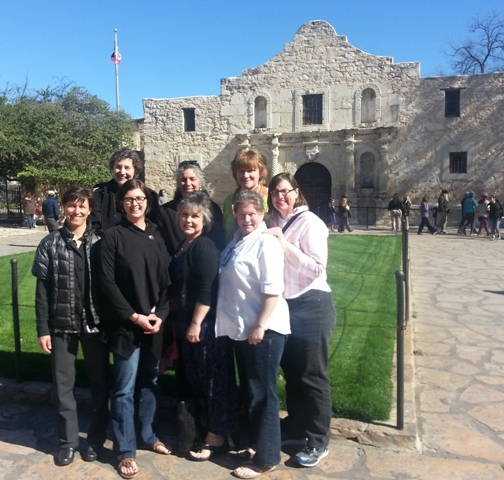 During the Mountains & Plains Independent Booksellers Association's January board meeting in San Antonio, Texas, last week, the board posed in front of the Alamo: (from left in the top row) Claudia Maceo, the Twig Bookshop, San Antonio; Andrea Avantaggio, Maria's Bookshop, Durango, Colo.; Valerie Koehler, Blue Willow Bookshop, Houston, Tex. ; Meg Sherman, Norton; (from left in bottom row) Liesl Freudenstein, Boulder Bookstore, Boulder, Colo.; MPIBA executive director Laura Ayrey; Vicki Burger, Wind City Books, Casper, Wyo. ; Anne Holman, the King's English, Salt Lake City, Utah. Police in Lakewood, Colo. are searching for a man who robbed a bank Tuesday, ran across Colfax Avenue as he "dropped a lot of money and raised a lot of suspicion when he headed to the Barnes & Noble book store," FOX-31 Denver reported. 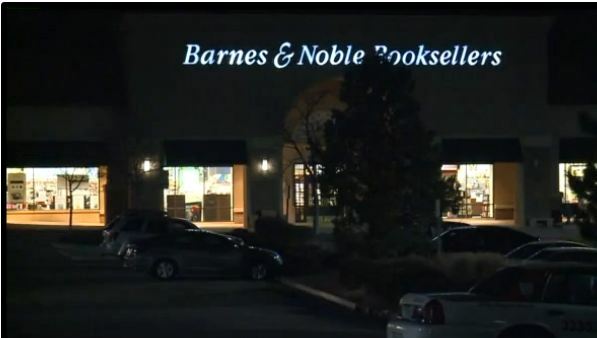 B&N employees said the suspect "walked nonchalantly into the men's restroom... they believe the suspect planned to stash the money in the toilet and then try to retrieve it later," FOX-31 noted. "Police credit the alert book store employees with creating a good ending for what was a dangerous situation. It's unclear how the bank robber escaped." Damn Few: Making the Modern SEAL Warrior by Rorke Denver (Hyperion), in which the former head of basic and advanced SEAL training and star of Act of Valor talks about his book. 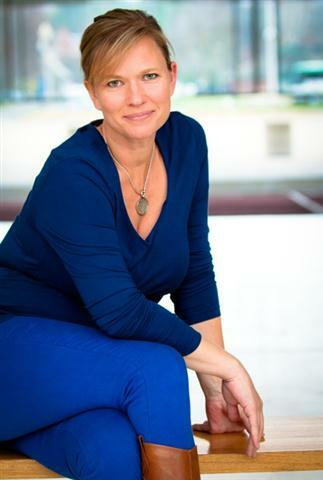 Tomorrow on CNN's Weekend Early Start with Randi Kaye: Kim Kavin, author of Little Boy Blue: A Puppy's Rescue from Death Row and His Owner's Journey for Truth (Barron's Educational Series, $22.99, 9780764165269). Saturday on Huckabee: Heather McDonald, author of My Inappropriate Life: Some Material Not Suitable for Small Children, Nuns, or Mature Adults (Touchstone, $24.99, 9781451672220). Sunday on NPR's Weekend Edition: Mike Piazza, author of Long Shot (Simon & Schuster, $27, 9781439150221). Sunday on Meet the Press: Gavin Newsom, author of Citizenville: How to Take the Town Square Digital and Reinvent Government (Penguin Press, $25.95, 9781594204722). Sunday on CNN Newsroom: Dave Barry, author of Insane City (Putnam, $26.95, 9780399158681). Sunday on CNN's GPS with Fareed Zakaria: Kishore Mahbubani, author of The Great Convergence: Asia, the West, and the Logic of One World (PublicAffairs, $26.99, 9781610390330). Emma Roberts (Nancy Drew, Scream 4) will star in the FOX drama Delirium, based on Lauren Oliver's bestselling trilogy. According to the Hollywood Reporter, Karyn Usher (Touch, Bones, Prison Break) wrote the pilot and will executive produce with Peter Chernin and Katherine Pope, as well as Paula Mazur and Mitchell Kaplan of Mazur/Kaplan Company. Kaplan is the founder and owner of Books & Books, with stores in southern Florida, the Cayman Islands and New York. David Walton (Bent, Perfect Couples) will star in About a Boy, NBC's pilot based on Nick Hornby's novel, which was previously adapted as a feature film in 2002. The TV project is written by Jason Katims (executive producer of Friday Night Lights and Parenthood) and directed by Jon Favreau (Revolution). Barbara Ketcham Wheaton, author of the classic Savoring the Past: The French Kitchen and Table from 1300-1789, was cited for her "pioneering research into cookbooks as historical documents." Peter Workman, founder of Workman Publishing Company, whose Workman imprint "revolutionized trade-paperback publishing in the United States and has been home to many of the most important cookbooks of the past forty years and whose Artisan imprint helped change the look of modern cookbooks." The awards will be presented this evening, February 8, at the Roger Smith Cookbook Conference in New York City. Amity Gaige is the author of the novels O My Darling and The Folded World. Her essays, articles and stories have appeared in the Yale Review, the Literary Review, the Los Angeles Times, the New York Times and other publications. She is the recipient of a Fulbright Fellowship, residencies at the MacDowell and Yaddo Colonies, a Baltic Writing Residency Fellowship and, in 2006, she was recognized by the National Book Foundation as one of five outstanding emerging writers under 35. She is currently a visiting writer at Amherst College, Amherst, Mass., where she lives with her family. Gaige's latest novel, Schroder (Twelve, February 5, 2013), recounts the seven days a father spends on the road with his daughter after kidnapping her during a parental visit. Two novels by Brits: The Sense of an Ending by Julian Barnes, and The Patrick Melrose Novels by Edward St. Aubyn. Also the engrossing Vera (Mrs. Vladimir Nabokov) by Stacy Schiff. Plus--in the name of full disclosure--a book about how to get your fussy baby to go to sleep, called On Becoming Babywise by Gary Ezzo and Robert Bucknam. For the sheer beauty and insight of his sentences, John Updike, specifically his short stories and the Rabbit tetralogy. I'd read Janet Malcolm's grocery list if she published it; she sees so clearly. Along those lines I might call Virginia Woolf the greatest prose writer in English, and Vladimir Nabokov the writer who most makes me want to write. Can I add here also Richard Ford and the powerful Annie Proulx? I love the brilliant and slim Joe Gould's Secret by Joseph Mitchell. It's Mitchell's portrait, which he began on assignment from the New Yorker in the 1930s, of a West Village bohemian who claimed to be writing a great work of literature. Joe Gould's Secret is about ambition, and dreams, and the writing life, and self-deception. It was the last thing Mitchell ever wrote; read it. Tree of Smoke by Denis Johnson. I'll know I've made it when somebody puts my name in a font like that. Honestly? The Wisdom of Insecurity by Alan Watts. I read it on a ferry to Martha's Vineyard years ago, in high wind, days before my wedding. "When the spring came, even the false spring, there were no problems except where to be happiest." --from A Moveable Feast by Ernest Hemingway. I happen to share a hometown with John Updike--Reading, Pa. When I read Rabbit Run, at the age of 21, while away at college, I felt that Updike had made the city far more vivid than it ever felt to me when I was there. It's almost as if I first apprehended the power of literature with that book; I saw that a great book gives the real world back to you transformed. The House Girl is an intricate debut novel that blends historical and contemporary fiction. Former attorney Tara Conklin uses art as a common thread intricately to connect the lives of two very different women separated by more than a century. In 1852 Virginia, 17-year-old house slave Josephine looks after her dying mistress, Lu Anne Bell, while trying to dodge her master's fists. Although her last escape attempt ended in recapture, abuse and the stillbirth of her child, Josephine is ready to run away again. Waiting for her chance, she soothes half-mad Lu Anne by putting finishing touches on the paintings Lu Anne is no longer able to complete. A naturally gifted artist, Josephine's talent far surpasses Lu Anne's, but her world has no place for a slave with her talents. In 2004, ambitious young attorney Lina Sparrow is assigned to a landmark slavery reparations case. If she succeeds in building a credible case, she could become a partner at her firm, but her supervisor's indifference and a backstabbing co-worker hamper her efforts. Then, through friends of her artist father, Lina learns of rumors that the celebrated Southern artist Lu Anne Bell's paintings may have been the work of a house slave. If Lina can find a descendant of Josephine to act as plaintiff, their case will have the perfect public face, but first she must solve the mystery of what happened to Josephine more than 150 years ago. Complicating matters, Lina's father suddenly wants to talk about her deceased mother after long years of silence, and Lina fears what she might learn about her brilliant, stifled mother. Shelf Talker: A deftly assembled debut novel about a young attorney trying to unravel the mysterious fate of a slave who may have been behind several acclaimed works of art. People fall in love with books. People fall in love with bookstores. People fall in love with other people in bookstores. People even fall in love with booksellers. "With Valentine's Day around the corner, this is the question that is naturally on every book lover's mind: When I go into my local bookstore, am I allowed to start flirting with the staff?" Sarah Rettger wrote on her blog Archimedes Forgets. Her entertaining reply included this pointed summary: "Short version: Of course!... Longer version: As long as you're not stupid about it." 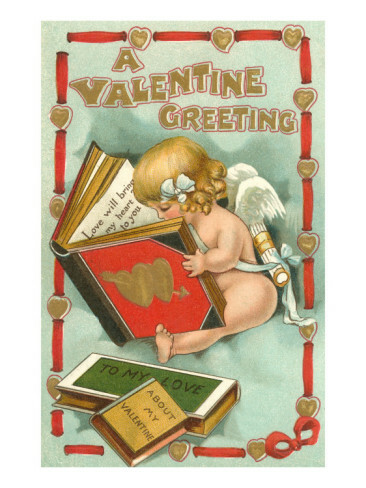 When I consider Valentine's Day, which is even now circling to land with its stubby Cupid wings, I can't help but think of books. It's just my nature. I love books. I love bookstores. I even fell in love with my wife in a bookstore. For the record, she was also a bookseller at the time. Forget greeting cards and roses and candy (Well, don't forget them. Booksellers love sideline sales, too). Giving the right books as gifts may be the real key to long-term commitment between readers. And Valentine's Day can turn even the most cynical bookseller into a relationship counselor, especially for those last minute "oh no I almost forgot" shoppers. Brookline Booksmith, Brookline, Mass. : "Folks, let's talk about something serious for a minute. I'm going to get right to it. In order for you to give flowers to your sweetie on Valentine's Day.... you first have to kill the flowers. Sever them in the prime of their brief, radiant life. Or worse, hire some mercenary floral assassin to do the dirty work for you. What sort of monster have you become? You'll never be able to wash their chlorophyll off your hands. Need an alternative to veg-icide? Why not save the roses and give your loved one the gift of reading?" Alright, look, so I can't promise you chocolate. But the coffee shop's next door. Greenlight Bookstore, Brooklyn, N.Y.: "We're not doing any official Valentine's Day events at Greenlight this year--but in a way, every event is our way of saying we love you. This month we've got electrifying poetry, moving and original fiction, vegan cookery (with tasty samples! ), top drawer comedy and a celebration of Black History Month. What's not to love?" Titcomb's Bookshop, East Sandwich, Mass. : "Do you remember the first book you read that made you fall in love with reading? The one that whisked you away to a foreign land or time, made you swoon, had you laughing or crying out loud, or changed your opinion.... The instant someone recommends a book that falls outside your comfort zone, and you accept the challenge to read it, that is when you know you have fallen in love with books. We invite you to share your love story with books on our Facebook page. How did your story begin? Maybe you can inspire others to fall in love with a book!" I'd already decided to write about Valentine's Day when a package arrived from BooksActually, an indie bookstore I love (though, regrettably, have never visited) in Singapore. I wrote about this wonderful bookshop some time ago and have remained in contact. as they twirl us round the shelves. with its narrow waist in your hand. 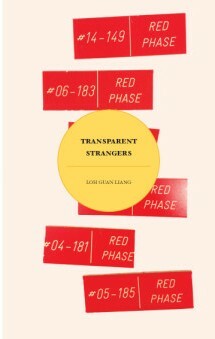 Happy Valentine's Day, book people.--Robert Gray, contributing editor (column archives available at Fresh Eyes Now).